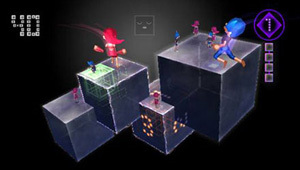 A WiiWare download game designed by Kenji Eno. Small people called Fallos live inside your Wii Remote, but they want to live on cubes suspended in space on your TV instead. You have to flick the Fallos from the Wii Remote and onto the cubes. When the Fallos land, the cubes will be unbalanced, threatening to tip the Fallos into space. You have to throw more Fallos to keep the cubes balanced. Once you have thrown enough Fallos onto the cubes and they stay on safely, the stage is cleared and you move on to the next arrangement of cubes.